Andy Ockershausen:	This is Andy Ockershausen, this is Our Town. And I’m so delighted that the producer and executive producer and the money person behind Our Town, is going to take over this show and I’m going to sit here and listen to her. So, Janice Ockershausen its all yours. Janice Iacona Ockershausen:	Thank you honey. Today we are recording the final episode of Our Town, Season Three. Andy Ockershausen:	Save the best for last. Janice Iacona Ockershausen:	That’s right, that’s exactly right. Andy Ockershausen:	He’s been around too. Janice Iacona Ockershausen:	He has been around. Preparing for this interview today, it brought back so many memories, I was up at 3:00 in the morning thinking and laughing to myself about how great this interview was going to be. That nostalgia is really good and it’s good for the soul. I was really up for this interview today. Andy Ockershausen:	Forever! You think of one you think of the other. Janice Iacona Ockershausen:	That’s right, he hasn’t worked at WMAL for the past 14 years, but he was such an instrumental part of our product. His name is Burt Cohen, often referred to as the Duke of Derwood. He’s a good friend and we’re so glad to see you back Burt for a little while from Florida, as a snowbird. We welcome you back to your studio. Janice Iacona Ockershausen:	At WMAL. Ken, Burt Cohen, Burt Cohen, Ken Hunter. Ken Hunter:	I’ve been waiting for the introduction. Burt, hey Burt. Andy Ockershausen:	When he started with this Derwood, so many people had no idea where Derwood was. I know that for a fact. Burt Cohen	Do you know where the Duke of Derwood came from? Burt Cohen	Whenever Trumbull and Core would end their show at 7:00 they would thank me and put in a little soundtrack of some funny things. They wanted to thank the Dude from Derwood. One day, we’re sitting out in the kitchen eating lunch. Andy Ockershausen:	The lunch bunch. Burt Cohen	Yeah. The lunch bunch. Janice Iacona Ockershausen:	Yeah, that’s right. Janice Iacona Ockershausen:	Oh that’s great, at the lunch bunch. I think I was probably there that day. Andy Ockershausen:	Yeah, that was a big part of the history of WMAL, was the lunch bunch. I was not privy to be part of it. Janice Iacona Ockershausen:	You bought pizza every once in a while though. Andy Ockershausen:	Yes occasionally, particularly on snowy days, I’d buy pizza for the group. They were low lifes, I didn’t want to spend time with them. They were talent and engineers and news people, I wanted to spend my time with leaders. Andy Ockershausen:	So, I couldn’t find a leader. So I spent my time at Alfios. Janice Iacona Ockershausen:	We just spent the last couple of minutes with Ken, playing some bloopers, or actually the signature tapes from Trumbull and Core, talking about Burt Cohen. We’ll play those throughout the podcast. Who is Burt Cohen? Surely Everyone Knows! Andy Ockershausen:	First you’ve got to explain, who is Burt Cohen, because everybody does not know Burt unfortunately. Janice Iacona Ockershausen:	I just assumed everybody knew who Burt Cohen was. Burt Cohen	Really old people. Andy Ockershausen:	What he did was, he became talent, but he wasn’t talent in the usual way, he became talent because he could run this board and run the tower. Burt Cohen	I wasn’t paid like talent was. Andy Ockershausen:	No he wasn’t. You were overpaid. Janice Iacona Ockershausen:	I think you did all right Burt. Andy Ockershausen:	But honey, what he brought was his talent to the talent and made them better than what they were. Janice Iacona Ockershausen:	That’s right. Andy Ockershausen:	I lived through that. Burt Cohen	Working with Bill Trumbull, Bill Trumbull was one of the funniest, quickest minds I ever met. Bill Trumbull was one of the most insecure people you ever met. Every day was like his first day on the air. I think I had a tendency to keep him calm and anticipate what he wanted next. That’s why we worked so well together. Burt Cohen	His ‘hinky bag’. Janice Iacona Ockershausen:	(laughs) he would blow into that paper bag because he would hyperventilate, before he went on the air. Burt Cohen	Every day was like his first day. Burt Cohen	I always thought he was kind of a cross between Rodney Dangerfield and Don Rickles. Janice Iacona Ockershausen:	And Steve Allen. Burt Cohen	And Steve Allen. Andy Ockershausen:	He was such a talent. Burt Cohen	One of the funniest men, quickest minds, you’d say something, he’d come up with a funny line. Janice Iacona Ockershausen:	Yeah, we don’t want to … there are such. Andy Ockershausen:	We don’t want to get ahead of ourself. When Burt came, he was a young guy from Fond du Lac. . .
Burt Cohen	Wisconsin. I left there in ’57. Andy Ockershausen:	Where did you go in ’57? Burt Cohen	Since I was a young boy, I was always fascinated by radio. I would stay up at night listening to the AM broadcast band. Janice Iacona Ockershausen:	Ham Radio. Burt Cohen	I got into Ham Radio. Through that, I met the chief engineer of the local broadcast station. Every Saturday, I would get on my bike and ride over there and watch them work. I said, “Some day, I want to work at a radio station.” And that’s what I did. Andy Ockershausen:	In Fond du Lac? Burt Cohen	Madison, I graduated high school, ’57 by then I had my first phone, my commercial license, you need to work at a radio station. Went to Madison, partied and flunked out. (laughs). Janice Iacona Ockershausen:	That explains a lot. Burt Cohen	Yep, come here try it out, if it works fine, if not, go back to Wisconsin and drink beer with your buddies. So, I came there and two years later, I graduated. The funny thing is while I was working, or I was going to school, I was the TV repairman at the Willard Hotel. Burt Cohen	The old Willard. I was the TV repair man while I was going, after class, I would go there and sit and repair TV’s. Andy Ockershausen:	At 14th and Pennsylvania Avenue? THE Willard? Burt Cohen	THE Willard. They had 14 inch black and white TV’s at the time, 1962. Andy Ockershausen:	Get us on the air no matter what. Burt Cohen	I had back up and I had back up for my back up for my back up. I was very nervous about something not working. Andy Ockershausen:	Oh Burt, what you brought was, in addition to your talent as an engineer, there are no more engineers then there are technicians, you understand, technical advisor. What you brought to that was, you made everything safe for the talent and they appreciated that. Burt Cohen	Also, doing the Redskins game, I don’t know how that, if you know the story of the Redskins games, the WMAL, the local staff, the local engineering staff, only did the home games. Andy Ockershausen:	I know that. We couldn’t afford to travel. Burt Cohen	Right, and you hired contractors out of town. There was a game in Philadelphia where something got messed up and nobody showed up to do the game. Steve Gilmartin and Mal Campbell did the game on the telephone. Janice Iacona Ockershausen:	So, that was 1967 to 1991. Burt Cohen	That’s right. It was fun. I did 23 years of it including four Super Bowls. Andy Ockershausen:	And they haven’t won anything since. Burt Cohen	The curse of WMAL. The last game I did was the Super Bowl in Minnesota against Buffalo. Then they lost the contract and they have the curse of WMAL, they haven’t won anything since. Janice Iacona Ockershausen:	But you know, they’re back on WMAL now. Burt Cohen	That’s what I’ve heard, yeah. Andy Ockershausen:	Just the broadcast. Andy Ockershausen:	It’s still not part of the show, as you remember because you guys did it. WMAL was a part of the Redskins show and Trumbull and Core were part of that. Janice Iacona Ockershausen:	All week long, all weekend, all year long, every day. Andy Ockershausen:	Every night, something about the Redskins. Burt Cohen	It was fun. Then the John Riggins years with the diesel horn. Andy Ockershausen:	Oh that was you. Sam Huff Recording:	There’s the snap and Riggins, good hold! He’s got the first down, the 40 he’s gone! The 35, the 20, he’s gone! He’s gone! Touchdown! Washington Redskins! Holy cow what a play! 42 yard touchdown … fourth and a foot. Burt Cohen	I still get goosebumps when I hear it. Janice Iacona Ockershausen:	I do too. Andy Ockershausen:	Oh I do too. Burt Cohen	“He’s gone, he’s gone!” Great, and you can hear the diesel horn in the background. Andy Ockershausen:	He broke away from that Miami defensive back who was pulling his jersey. I was there, but we were all up top, remember we were all sitting way up at the top. Andy Ockershausen:	Terrible location, but you guys were having so much fun. And you had talented people to work with. Burt Cohen	Yeah, we had Johnny Holliday doing the pregame show, and Frank, Sam and Sonny. I know you know this, they ran a survey and they found that more people in Washington turned their TV audio down and listened to the radio than any other city in the NFL. Janice Iacona Ockershausen:	Because we promoted the heck of it. Andy Ockershausen:	That was promotion, to let people know. Janice Iacona Ockershausen:	We even had a jingle. Andy Ockershausen:	No one does that anymore. Janice Iacona Ockershausen:	I know. It’s because of the delay I think. The delay in digital. Burt Cohen	After they left WMAL, they went out to FedExField, I went to one game out there and hated it and never went back. Andy Ockershausen:	I can see that. It’s tough to get to and once you get there it’s too big. Burt Cohen	RFK has such personality, I mean, it rocked. Janice Iacona Ockershausen:	You could feel it sway. Burt Cohen	Dallas Week, we couldn’t sleep all week waiting for Sunday. Andy Ockershausen:	Burt, the magic changed dramatically, the money changes everything. Janice and I talk about it, there was more of the Redskins than just the game, it was chemistry. Andy Ockershausen:	The audience, those people would call up all hours of the day and night to talk to Sam or Sonny or Frank, and you lived through it. Burt Cohen	What a team. Jurgensen. The Redskins would break the huddle and they would line up and he’d say, It’s going to be a pass to Monk in the flat. And he’s be right 90% of the time. He’d call the play as he broke the huddle. What a great team. 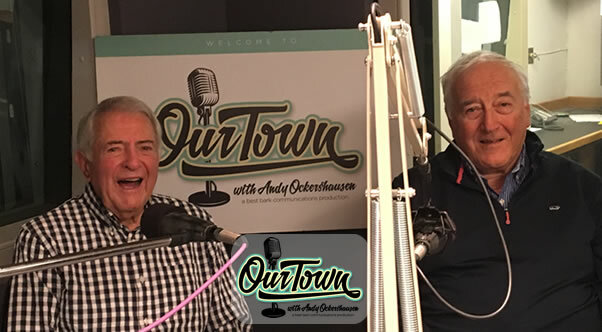 Andy Ockershausen:	Herzog was our first guest on Our Town, that was Janice’s idea, Frank Herzog was right there because he was in town at the Hall of Fame and we put him on. This is the Janice Ockershausen show, and this is Our Town. Janice Iacona Ockershausen:	Today we’re talking to Burt Cohen and we’ll be right back after these messages. [Begin Commercials] Guy: Okay, keep your eyes closed. GEICO Announcer: GEICO, because saving 15% or more on car insurance is always a great answer. Janice Iacona Ockershausen:	Or, visit their website, at Geppettocatering.com. Andy Ockershausen:	And tell them Andy O from Our Town told you to call. Ask for Josh, he’s the man, he owns it. He’s a great, great guy. Janice Iacona Ockershausen:	Welcome back to Our Town this is Janice Ockershausen, sitting in with Andy Ockershausen host. Andy Ockershausen:	Remember me, I used to be here. Janice Iacona Ockershausen:	That’s right. And today we welcome back Burt Cohen, who worked with Andy and I for many years at WMAL. Andy Ockershausen:	Big part of the success of WMAL was the technical part and Burt was the leader in that because he came part of the show. Whatever show he worked on, he became part of it. And it worked. Burt Cohen	You know, we were talking about the Redskins, we used to go up to Carlisle to cover Redskins training camp. One guarantee every year was that Bill Trumbull would get lost. Burt Cohen	He would get lost every year. We had a bet that Trumbull would get lost. Every year he did. He couldn’t find his way. Andy Ockershausen:	That was Bill. How did Chris live with that all the time? He grew himself by being with Trumbull. Andy Ockershausen:	Made Chris a better performer. Burt Cohen	Bill Trumbull, in the time I’ve known him, he probably moved six or eight times and bought a smaller house with a bigger mortgage. I remember at one time he had a 17 1/2% mortgage on a house and he’s trying to explain to me … I said forgot it it’s too complicated. Andy Ockershausen:	Smaller, with more. Burt Cohen	Smaller house with a bigger mortgage. Janice Iacona Ockershausen:	And he did the same … tell them the story about the Lexus, that is hysterical. Burt Cohen	I don’t remember that. Janice Iacona Ockershausen:	Toyota and Lexus were made by the same company obviously, I don’t remember the details but I remember the laughs. Burt Cohen	He was the only guy who would buy list price and tip the salesman. Janice Iacona Ockershausen:	Tip the salesman. He had bought a Lexus and he traded it in and it cost more for a Corolla. It was one of those crazy Trumbull things that he did. He always was upside down when he came out. Burt Cohen	As smart as he was, he wasn’t a financial genius. Janice Iacona Ockershausen:	No that’s for sure. Andy Ockershausen:	He was so funny, you could fool him with so many things and you would have to listen and you’d sit there and wonder, what is this man doing with his life? Janice Iacona Ockershausen:	They were the funniest bits on the show. Andy Ockershausen:	What did he do, he used to drink a case of beer a night? With his wife? Burt Cohen	Funny story, I looked all over and I couldn’t find the tape of it was, I put up a TV antenna in Bill Trumbull’s attic, and I fell through the ceiling. Janice Iacona Ockershausen:	I think Dave Sproul had that. Burt Cohen	Right into, Nancy’s in the bedroom, I came through the ceiling and I looked all over, I couldn’t find the tape of it. It was one of the funniest bits Bill ever did. Andy Ockershausen:	You can’t make this up. Janice Iacona Ockershausen:	On WTOP. Andy Ockershausen:	On WTOP. Doing very well, he does all the commercials, I’m sure he’s in the union. Must be a good deal. Did you ever work Felix’s show? Burt Cohen	I did Felix and Bill Mayhugh for a couple years. Andy Ockershausen:	Mayhugh when he was doing all night? Burt Cohen	Doing the all night thing, I did Felix for two hours and then Mayhugh for a couple of hours and tried to stay awake. To show you how dominate WMAL was, the fill-in guys on weekends, were Mac McGarry and Paul Anthony. Burt Cohen	Shows you how strong the station was. Andy Ockershausen:	How’s that for talent? Burt Cohen	And that’s how I got to know Bill Trumbull, working with Bill, and Bill and I worked out very well. 1974, they moved the studios from Greentree down here. About that time, they decided to have a Two For The Road show. Bill Trumbull and Ed Meyer. A year or two later, Ed went back to the newsroom and they brought in this weekend sports guy. Sports kid, Chris Core. Burt Cohen	It became the Trumbull and Core show and for 25 years. Andy Ockershausen:	It was two for the road originally. Andy Ockershausen:	Then we had Beatrice in. Did you ever work Ken’s show? Burt Cohen	I can tell you this now, because you can’t fire me but, Trumbull and Core would sign off at 7:00, we had five minutes of network news and then Beatrice would come on and, Good Evening, screaming, good evening right? Andy Ockershausen:	He loved it. Burt Cohen	Right, so what I did, when I got off, I put the mic level all the way to the top as high as it would go then the guy that replaced me, came on, opened the mic at 7:05 and Ken says, Good Eve- and knocked the transmitter off the air. Andy Ockershausen:	But he loved it. Janice Iacona Ockershausen:	He was so enthusiastic. Andy Ockershausen:	He couldn’t wait for the show to start. Burt Cohen	He was something. Andy Ockershausen:	He’s stay in the office til one or two in the morning isn’t that right? Burt Cohen	Yeah, taking phone calls. Andy Ockershausen:	He loved what he did, but it showed. Burt Cohen	I did a boxing match once. Sugar Ray Leonard with Tim Brant and Ken Beatrice. Tim was supposed to do the blow by blow and Ken was supposed to do the analysis between rounds and Ken wouldn’t shut up. I had to sit between the two of them to keep them from killing each other. Andy Ockershausen:	(laughs) They were characters and characters are what made this station so great. Everybody was a different character. Johnny Holliday, he brought his own enthusiasm. Burt Cohen	Eddie Walker was one of my favorites. What a talent he was. Andy Ockershausen:	Who was telling me some stuff about Ed just the other day, about Walker and his music shows were special. People liked them because of Eddie. Burt Cohen	Amazing guy. One of the most amazing human beings I ever met. What he could do. Burt Cohen	Once you met Ed and you said hello, he would recognize your voice and you’d see him a year later and say, Hello Ed. And he would know who you were. Andy Ockershausen:	Oh absolutely, he was … he had total recall because he couldn’t see, he had to remember. Janice Iacona Ockershausen:	Let’s not forget Pete Wysocki. Burt Cohen	I did the Feds. . .with Pete Wysocki. Andy Ockershausen:	It lasted a year. Johnny Holliday. Janice Iacona Ockershausen:	Pete was dressed up as Jackie Bill that one particular year for the parade. Burt Cohen	I had my own band, The Duke of Duchess Band. Andy Ockershausen:	Duchess was in the parade. We got that filmed somewhere. Honey, I want to see that again, the parade film with Harden and Weaver in a bed and their night clothes and Bill was pulling Chris Core, right? Burt Cohen	When I started here in 1965, August ’65, I got married in September of ’65 so, 53 years I’ve been married. Burt Cohen	Luckiest woman in the world. Burt Cohen	It was farmland. Andy Ockershausen:	I know that. People didn’t know where it was. Burt Cohen	They still don’t. Andy Ockershausen:	Burt, what other guys did you, anybody you did not like to work with that they stuck you with? Andy Ockershausen:	They wouldn’t let me on. Andy Ockershausen:	No, because of the shift. Burt Cohen	They had Bob McKusuk was their engineer. Janice Iacona Ockershausen:	And Donna. Andy Ockershausen:	Who was the girl? I didn’t do much of the morning show. Andy Ockershausen:	They were all 4:00 starters, they got here early. No substitute. How about the weekends? We had a lot of talent on the weekends as I recall. Burt Cohen	After I worked here a while I got off of weekends, I worked Monday through Friday. Andy Ockershausen:	Yeah, you had it made with the talent. I remember how Trumbull got off. This is Andy Ockershausen, I used to be Our Town but now it’s Janice’s Town and we’re so happy to have Ed with us. Janice Iacona Ockershausen:	Who’s Ed? Janice Iacona Ockershausen:	Yeah we’re talking to Burt Cohen. This is Our Town I’m Janice Ockershausen and we’ll be right back. Andy Ockershausen: This is Our Town and one of the things that happened in our early relationship Burt Cohen and Janice was a country called Ireland. We had a chance to go through the Aerlingus, the airline, to go to St. Patrick’s Day in Dublin. We jumped at it and we had Trumbull and Core, I mean Harden and Weaver first and then they talked me into, why don’t we have Trumbull and Core go, so we have all our main talent in Ireland for May 17th, 1983. Not may, March. What a wonderful trip. It was Burt Cohen’s introduction to Ireland. Burt Cohen A funny story is, Ed Painter and I were the two engineers scheduled to do that. A couple of weeks before, we had a problem with the airlines losing the equipment and not getting it. We were afraid of that. We were going to carry our own equipment. The plan was we would leave Dulles, fly to Boston and then go to the international flight there. Andy Ockershausen: Connect in Boston. Burt Cohen Connect in … we were going to carry our own equipment. We get to Boston, the plane is a little bit late, were waiting, finally our equipment comes up. To go from the regular terminal to the international terminal, you have to take a bus. We go out there, we’re waiting, it’s pouring rain, we’re looking at our watch, Oh my god, we’re going to miss our flight, we’re going to miss our flight. Finally the bus comes, the only person on the bus, some old man sitting in the back in a raincoat. We get to the international airport, run like crazy and check-in just in time. As we’re boarding the plane, the stewardess says, You two guys go up to first class. We thought, What the heck is this? The rest of the crew is sitting in coach and Ed and I are sitting in first class having a drink and laughing. Just then, the cockpit door opens, out steps the captain and he says, I don’t know what you guys are worried about, the plane wasn’t going any place without me. It was the guy that was on the bus with us, the old man in the raincoat was the captain. Andy Ockershausen: He’s sitting in the back. Burt Cohen He’s sitting in the back listening to us worried about we’re not going to make it. He says, I don’t know what you guys are worried about. We went to Ireland first class. Andy Ockershausen: When I started flying, I loved to have gray haired pilots, I don’t care where they were, as long as they had gray hair, I was safe getting on the airplane. So, we go to Ireland, it’s a traditional Irish weekend, it was a parade and we were doing it from the mail room of the post office. Janice Iacona Ockershausen: In Dublin. Andy Ockershausen: Janice was directing the morning and Eileen was there. Burt Cohen I went to the Mayor’s ball. Andy Ockershausen: The first group in that parade was from Fairfax, Virginia. I will never forget that. That was Ireland, on St. Patty’s day. Janice Iacona Ockershausen: Another funny thing, was that at the Lord Mayor’s ball in Dublin that night for St. Patty’s day, the first song that they came out of the box with was, Take me Home, West Virginia. Andy Ockershausen: Almost heaven, West Virginia. Janice Iacona Ockershausen: Yeah, it was very Americanized. Andy Ockershausen: And the bars and stuff weren’t open. They did not open until afternoon. Burt Cohen I acquired a taste for Guinness. Janice Iacona Ockershausen: Yeah, me too. Andy Ockershausen: It’s all changed now, now it’s a commercial venture, now it’s all about Ireland. They make so much money with it. I think we were the first group, I mean there were a lot of people covering it, but nobody did it the way we did it. Andy Ockershausen: And it was great for our staff and great for our talent. It was fun. Burt Cohen Another thing I remember is, going up to Atlantic City with Tony Renaud to record Frank Sinatra, one of the highlights in my life is getting my picture taken with ole blue eyes. Andy Ockershausen: Oh my god. I remember he called him Mr. S.
Tony wouldn’t call him Frank, he would call him, Mr. S.
Burt Cohen I’ll tell ya, Frank Sinatra had more security than the president of the United States. I covered all the inaugurations, the president didn’t even have that kind of security. Andy Ockershausen: No, he was really special in those days. Janice Iacona Ockershausen: He came to the Kennedy Center, I remember the stagehands told me, he was just handing out $100 bills. Thank you, $100 bills. Burt Cohen I missed that. Andy Ockershausen: I went with Tony down to see him at the Madison Hotel. Mr. S. And some talent from another station was trying to get into the building. Tony said, “Don’t let that guy in no matter what you do.” Tony had that only interview with Mr. S.
Remember, the Madison Hotel was a big place for all the celebrities. Burt, now tell us the story, maybe the most priceless Trumbullism I’ve ever heard, I heard Chris tell it at Trumbull’s funeral and it is priceless. Burt Cohen I was part-owner of a racehorse with Sam Huff. Sam had this big farm out in Leesburg and he convinced me to invest in a racehorse and I lost my shirt. The horse ran and Chris Core, happened to be at the race and covered it. It sounds like a fake, but every word is true. Chris Core: Now a true story on WMAL, is it alright if I tell it? Well, our engineer, the Duke of Derwood, Burt Cohen, told me about it. Was it about a year ago? That as an investment, he had bought interest in a racehorse, now, not a tremendous amount of money but still. The interest in a racehorse as an investment. I told him at the time, I haven’t grown up around animals, that there’s probably nothing more risky in the whole world than to invest in animals to begin with. Bill Trumbull: Well, just look at the horses legs for example. How thin they are. Chris Core: Everything about animals, it’s risky, you can’t control them, even livestock it’s a risky business. Of all the things you can invest in, probably the most risky is racehorses. Even if, as you say about their legs, even if they, you know you feed them and take care of them and they have the right breeding, there’s no guarantee they’re ever going to win any races, you just don’t know. Bill Trumbull: That’s true you don’t know. Chris Core: Well, for the last year or so, Burt’s been talking about his horse, very fondly, and he goes out to Charles Town or wherever for the races and I believe won a race once. One time this year. No it did. It’s beautiful. Anyway, he told me that this Sunday he was going out to Charlestown, the horse was running and I said, “You know, I go about twice a year, I like to go out to the races, I’ll tell you what, I’ll come out on Sunday and watch it with you.” I got out there on Sunday and sure enough there was Burt and Vivian and they were all getting ready. Bill Trumbull: Were they like in the owners boxes? Chris Core: Well, no, as it turns out, I got in the owner’s box. See, I didn’t know. I didn’t know anything about. It’s $3 to get in, you want a box seat, okay it this, it’s this, I ended up with a better seat than they did. So I invited them down, i literally had an owners box it was right on the field it was good. Bill Trumbull: Third base line or . . .? Chris Core: Yeah home plate. Perfect. The first thing I did was look in the program to see when Burt’s horse was going to run and it was going to run the sixth race. There are eight horses running in the sixth race. It got pole position eight. Right there, I should have known, because it’s a disadvantage being on the outside. It takes you a lot longer. Bill Trumbull: Yeah you have further to go around. Chris Core: It would be better to be number one. Bill Trumbull: It’s like being side one, cut one. Chris Core: It’s not that you can’t win, it’s just that that’s … so, all right, first five races, I’m making a little money and I’m conservative, I’m betting maybe three $2 bets at a time, I’ll pick like somebody to show or place. Bill Trumbull: Always got a back-up bet. Bill Trumbull: Does it talk like Mr. Ed or anything. Chris Core: No I’m serious, it’s a beautiful horse. Don’t make fun of this, this is serious. Bill Trumbull: No. I’m not making fun, I’m serious. I’m not as serious as he is. I don’t have a nickel in this. Bill Trumbull: Plus it’s a beautiful horse. So, I figured how much I was going to bet. At first it was going to bet $20 to show. Bill Trumbull: That’s a nice bet. I said let’s go outside and watch it at the rail, it’s cold but for one race why not? They’re off, by the first turn out of eight horses, the horse is seventh. Bill Trumbull: Well, he moved up one. That’s good. Chris Core: That’s good. By the second turn the horse is last. Bill Trumbull: Well, he dropped one. Chris Core: In the backstretch, the horse is so far last that it seems as if it’s going to be running in the next race. I mean, there’s the race and then way back here is Burt’s horse. By the third turn, the horse is lying on its back with its legs sticking in the air. Literally turned upside down on the track with its legs pointing straight up in the air. Bill Trumbull: Somebody birdshot it? Chris Core: An ambulance goes screaming over there, we figured the thing had a heart attack. The jockey comes limping away, the horse is still lying on its back with its feet straight up in the air. Burt did not look happy. Time goes by, Burt talks of a life insurance policy on the horse. Finally, and thank goodness, the horse gets up, he’s okay, it just seems that he was running so hard for him. Bill Trumbull: Got the wind knocked out of him. Chris Core: It was not bred to run. It’s a racehorse and he passes out from running too fast and he was dead last in the worst race he could run in. Burt looked relieved that the horse wasn’t dead. Burt, somehow the sport of kings doesn’t seem to include Duke’s. Burt Cohen Well, the horse passed out and almost died on the course and is laying there. It was funny. Andy Ockershausen: Trumbull was an investor too wasn’t he? Burt Cohen No, just me. Janice Iacona Ockershausen: Just the smart one. Burt Cohen Bill didn’t have any money. Andy Ockershausen: The old days, which were the good glory days of WMAL, particularly about the Trumbull and Core show, and particularly because more people listened, nobody did any work in those four hours because everybody in the building was listening to Trumbull and Core. Janice Iacona Ockershausen: Yeah, so here’s a funny one with Burt, Trumbull and Core talking about Burt and his job application. Chris Core: You know our master control technician, Dr. Burt Cohen. Bill Trumbull: Yes indeed, is that a doctorate that he received? Chris Core: No, it’s from the pepper company. Kind of doctor. Bill Trumbull: Like Dr. J.
Chris Core: Dr. Pepper. Burt is not, how can I say this nicely? Chris Core: Not the brightest guy in the world. Burt’s a little slow now, that’s now though. When he first came to WMAL, he was worse, you think Burt’s a little slow now, I mean, Burt was really dumb. Bill Trumbull: How dumb was he? Bill Trumbull: Course he was single then. Chris Core: Yeah, that’s right. Burt was just 25 years old and he was looking for his first big job in radio. Again, just off the farm from Fond du Lac, Wisconsin. Here it is, you read the questions on the WMAL employment form and I’ll read Burt’s answers. Chris Core: Once, in Green Bay. Bill Trumbull: Height, weight and date of birth? Chris Core: 6’2, 250 pounds, July 6th, 7th and 8th. Bill Trumbull: Sign born under? Bill Trumbull: Father’s alma matter? Chris Core: A winner never quits, a quitter never wins. Bill Trumbull: What do you run in the mile then? Chris Core: Shorts and a t-shirt. Chris Core: Salt water taffy. Chris Core: No, just two floors. Bill Trumbull: Finally, what things did you take in high school? Chris Core: Radio, jewelry, TV sets and money. Andy Ockershausen: We got off with that one. That was so good. You know the amazing thing is, both these guys were good writers. Andy Ockershausen: It’s a wonder they didn’t stumble over each other but they didn’t. Burt Cohen A lot of this stuff came right off the tops of their heads. Burt Cohen Jackie Bill. Bill used to write his Jackie Bill scripts and he would bring them into the lunchroom and read them and he would watch my reaction. If I didn’t laugh he would get all upset. It wasn’t funny? It wasn’t funny? Janice Iacona Ockershausen: Well you know, it would be time for you yet because you would see the line outside the window over here of the broadcast booth and everybody would be lining up for Jackie Bill. Andy Ockershausen: You know, Chris was good enough to let Jackie Bill do their own thing too. He was so smart, he reacted to everything Trumbull said, couldn’t rehearse that. Burt Cohen The rim shots and … “Is it time for me yet?” Very very funny. Janice Iacona Ockershausen: Do you have any of those old Jackie Bill’s? Andy Ockershausen: No we didn’t save any of them. Andy Ockershausen: Charlie my boy! Burt Cohen I told him he’d never amount to anything. Andy Ockershausen: He came up from Lynchburg. Andy Ockershausen: Charlie was such an enormous talent later. But he remembered you, that’s amazing. Burt Cohen And the advice I gave him, get out the business. Janice Iacona Ockershausen: Robin Sproul’s. Andy Ockershausen: We went to Robin, you know, Robin started right in there as an intern and ended up running the whole thing for ABC and she gave her credit to, all she learned about news in the WMAL newsroom, with so many talented people. Burt Cohen Oh, what great news people I had, Bob Gneiser, Joe McCaffrey, Ed Meyer, Bud Steele. Janice Iacona Ockershausen: Carol Preston, Karen Leggett. Burt Cohen I think we ended up with four or five. Burt Cohen I had the letter. Andy Ockershausen: Oh yeah. Had the wrong time didn’t we? I wish I would have had one with AFTRA, but we got along with the union people all the time, we really did. Andy Ockershausen: John Jennings, he used to have protests all the time. Janice Iacona Ockershausen: Yes you did. Andy Ockershausen: Tears in my eyes thinking about it. Janice Iacona Ockershausen: I know, it’s been a good interview. Burt Cohen It’s been really fun, it really was. Janice Iacona Ockershausen: We wanted to just do a little, one more little thing that Trumbull and Core did about the baseball and pitching. Burt Cohen We’re playing a softball game against channel 9 and I was the pitcher, I gave up 11 runs in one inning. Jingle: WMAL channel 63, Washington. Bill Trumbull: I didn’t think he’d show up did you? Bill Trumbull: The master control technician. KEN BEATRICE: I thought he did a superb job. Bill: Ken wasn’t even at the game. Chris: I agree with Ken. Bill: 11 runs, in one inning he gave up? Ken: Young, he is bright, he is articulate, he is charismatic. Chris: He’s all the things. Ken: I hate to see him go out a loser. Bill: Oh, I’d say hefault, it was shotty fielding.Oh I’d saw him go out a loser. Chirs: No it wasn’t Burt’s fault. Shotty fields. Bill: He gave up 11 runs in one inning. Chris: No, he had his stuff. Ken: He’s an individual, you get greater production from than his physical attributes would lead you to believe possible. Chris: You look at him, I agree with Ken, you look at Burt and you say, they guy can’t do it and yet he was out there on the mound. I though he was brilliant. Bill: I liked the line drive off his stomach into right field. That was my favorite. Chris: Still in his stomach out there. Bill: Belly button winded up out in left field. Well, here we are at six minutes past 3:00 at WMAL, it’s Trumbull and Core. Janice Iacona Ockershausen: Aww, they were the best. Andy Ockershausen: Those were the years. Games against channel 9 were always special. Janice Iacona Ockershausen: I just wanted to say to Burt, it’s just been so wonderful to see you and see that you’re doing so well, that the lovely Vivian has been a good partner. Janice Iacona Ockershausen: That’s right. Burt Cohen It was fun times. Andy Ockershausen: He married royalty. He was nobody, until he married the Duchess. Burt Cohen It was fun for 40 years or 39 years, been gone 14 years now and a Florida snowbird and no snow to shovel down there. Burt Cohen Loving life. Grandpa, three daughters, three married daughters and four grandsons, life is good. Janice Iacona Ockershausen: That’s good Burt, it’s been so great catching up. We’re going to take one more look back with Trumbull and Core with cut number three. Chris Core: (music playing) you know what this song is? Bill Trumbull: No I don’t. Chris Core: Listen to it a minute. Bill Trumbull: The anniversary waltz? Chris Core: It is indeed. Today is, after all your bad mouthing him, today is the anniversary of the master control technician. Bill Trumbull: Oh my goodness, his wedding anniversary. Chris Core: This is the anniversary of Burt’s 17 years here at WMAL. Bill Trumbull: 17 years? My goodness. Chris Core: Yes, it was just 17 years ago today that Burt Cohen, wet behind the ears and fresh from the farm of Fond du Lac, Wisconsin, rolled out here to the big city in search of a job. Bill Trumbull: Yes he did. Chris Core: Burt went from tavern to tavern looking for a place to sleep for weeks and handouts and things like that. Finally, he bumped into J.B. McPherson, who was at one of the taverns. Bill Trumbull: We need an engineer. Chris Core: And how little did J.B. know that, that one night being loaded would lead to 17 years of bliss with Burt in the master control room in there and doing a fine job. Bill Trumbull: Blackmailed him too, that’s why he got the job. Chris Core: I think the pictures that he took that night, probably have proof to be good. Bill Trumbull: He still has the negatives. Chris Core: In all those years, Burt, I must say you’ve never made a mistake in there, your attitude is always been exemplary and particularly, it’s the wrong speed Burt, it’s the wrong speed, thank you. I think that Burt serves as an example to this industry, and so Burt on your 17th anniversary here at WMAL, Bill and I just wanted to give you a little present. Bill Trumbull: Congratulations to Burt Cohen, the only man in the history of radio, who could wow dead air. Burt Cohen Do you remember we also did the Washington Capital’s hockey? Burt Cohen With Ron Weber. Burt Cohen I remember doing the seventh game of the Stanley Cup against the Islanders, it went three or four overtimes. We sat down at 7:00, that game went til like 1:30. I had to go to the john so bad. Finally I said to Ron, just take your ques off the air, I’m getting out of here. I went, Ron sat there for the whole time and once that game was over, he ran. From 7:00 until after 1:30. Andy Ockershausen: He didn’t have a color man did he? He did it all by himself. Andy Ockershausen: And he got fired. That made me so furious, there was no reason for that. Andy Ockershausen: He was a great talent though. Janice Iacona Ockershausen: So, we had the Federals, we had the Redskins, we had the Caps. Janice Iacona Ockershausen: We had Maryland, we had Naval Academy. We had a lot of sports. Andy Ockershausen: Sports, we had a lot of sports. Janice Iacona Ockershausen: We had a lot of talent. Andy Ockershausen: People, credit us to starting sports talk radio, of course with Ken, he was so different and so peculiar, people tuned into him. Believe it or not. Burt Cohen Did you say peculiar? Andy Ockershausen: Yeah. He was particular too. He was prepared, you know that he was prepared when he went on the air. Whatever he was going to do, he was ready. Janice Iacona Ockershausen: Thank you Burt. Burt Cohen Thank you Janice. Janice Iacona Ockershausen: It’s been such a wonderful half an hour of nostalgia and good memories. Burt Cohen It’s been fun. Thank you. Andy Ockershausen: We had all the great years together and they will never take them away from us, that’s why we’re having so much fun Burt. Janice Iacona Ockershausen: This is Our Town, this is the end of season three, we saved the best for last, thank you Burt Cohen, I’m Janice Ockershausen along with my husband Andy Ockershausen. We’ll see you at Season 4. Announcer: You’ve been listening to Our Town, season three, presented by GEICO, our hometown favorite. With your host, Andy Ockershausen. New episodes are released each Tuesday and Thursday, drop us a line with your comments or suggestions. See us on Facebook or visit our website at ourtowndc.com. Our special thanks to Ken Hunter, our technical director and WMAL radio in Washington D.C. for hosting our podcast. Thanks to GEICO, 15 minutes can save you 15% or more on car insurance.